How about scrap wood storage? I haven’t done it yet, but I plan to build one of these in my shop. My shop is presently used primarily for welding and machining but will soon move more to wood working. Will be setting up a 20" planer, an 8"jointer and 3hp shaper across from the table saws soon in prep for some cabinet work. Nice. I like this one! Have you finished this up yet? I've made some pretty neat stuff in the past with my wood working tools But>>>>> Can't even find my table saw or router now. Buried under a pile of BS. Been needin to get it out and either do sumtin wit it or get rid of it. Yessir LOL but I need a bigger cart!! My little shop. It's amazing how fast you can out grow your space. My advice is when you draw up the space that you think will you need, double it! I like that, great idea for storing a bunch of wood in a small place. I have scrap pieces piled up on random shelves right now. Finally had a little time to start on my work bench. I may have framed it a little heavy, but it shouldn’t go anywhere. Gutting and revamping mine now... it's always been mostly storage, but now that I have spent almost a solid year on the house (for the wife), it's my time. 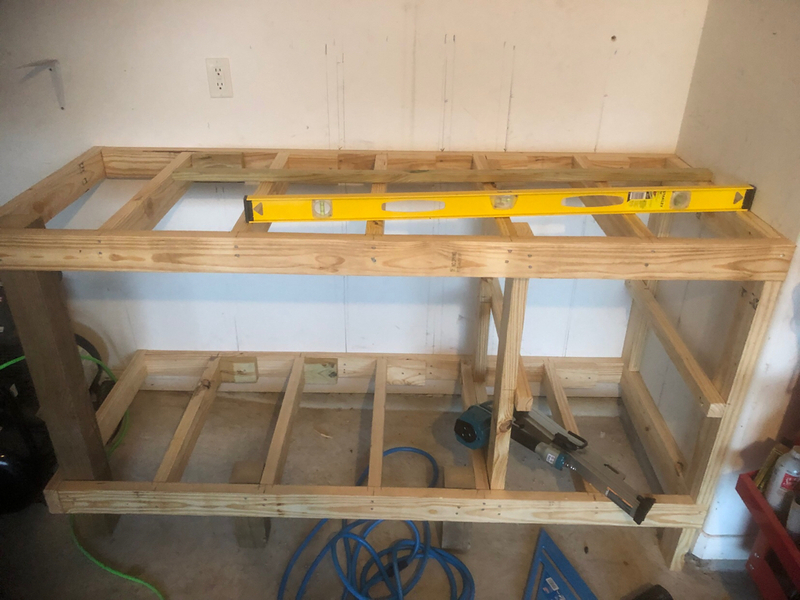 2nd project was the first of several work benches. I never had much luck with lighter weight, wimpy table or counter tops, so I decided THIS was was going to be a haus! The legs are all doubled 2x4 the underside of the lower shelf are 4x4. The top is 3 layers of 3/4" plywood with a 1/8" hardwood laminate top. Heavy is good... this thing stays right where I planted it. After some de-clutter, it was time to finally (after 20+ year) fill cracks and paint the floor. I did this mainly because the rough concrete could really only be swept with one of the typical "shop/patio brooms", which mainly served to fill the shop with dust. Ideally I wanted to be able to use a dust mop which does a better job getting everything and minimizes airborne dust. I'm also cheap, so I tend to recycle or re utilize any piece of scrap... and it beats a trip to the dump to get rid of. I have a decent stack of laminated wood flooring that I tore out for one of the wife's wish lists, so much of it it going on the walls for tool storage, magnet bars, shelves and drawer bottoms. After the miter station, comes a glue up table. Several years ago, I scored a 5'x 40" sheet of fire-slate. I think the only reason it has hung around is that it is too heavy to get rid of, so I sacrificed a couple saw blades ripping it lengthwise down the middle to use for a couple counter tops. This stuff it HEAVY, solid and impervious to chemicals. It's the stuff they used as science lab counter tops you'd find in a high school lab...did I mention it's HEAVY? Last edited by JFISHER; 01-16-2018 at 12:12 AM. Holy cow!! That cat looks awesome! Great job with his eyes, he looks very lifelike. I want to build a moveable wood working table, and was going to copy JFisher's top idea of the 3 pieces of plywood. I am struggling with the size though. I want a long table, and want to incorporate my table saw on one end. For the top, I was going to use use 3 full 4'x8' sheets, glued & screwed together. But now I am wondering if 4' is too wide? Should I trim them down to 3' wide? How wide of a table do you guys like? This will be a moveable table (casters), that I can walk all the way around, and work from any side. I had about a 4' table at one point, mostly because I was too lazy to rip a couple sheets of plywood. I found it to be way too wide for me anyway. In the end I found 36" to be just right. I actually wanted my table to be about 60" long, but the location of the new attic ladder require a little shorter table as mine wasn't intended to be mobile. Cool, thanks! I want mine mobile so that I can push it out of the way when not in use, as my shop is not just for wood working. Can you elaborate some on the 1/8" top? how did you attach it, and did you finish it with something? Last night I worked on adding a vac port to the underside of the miter station. I took the never used head from my shop vac and hot melt glued it to a piece of scrap pressed, bead board (same as underside of table). The unfinished side is pretty slick and should help funnel the dust down to the nozzle. Added another tube of caulk to seal it all up and it's pulling a god vacuum just from a dinky shop vac... can't wait to see how a larger version will work. All of you guys have nice shops. I built my wood shop 25 years ago before cell phone cameras. So no pics of when it was clean. Too embarrassed to take a pic now. I have an old Sears table saw. I need to change out the blade. The fence on this saw is terrible. The casters are shot as well. Does anyone have mods or updates for a table saws? I have to do something with it, the fence is driving me crazy. Any suggestions would be appreciated. I currently have a 4' table that i use as an outfeed table/assembly table etc. I like it. But i have the room though. It's on my list to redo, and I am going back with a 4' table. The top is basically thin cabinet grade plywood. Attached only with titebond wood glue and clamps. I gave it a light 200 sanding, then rubbed in boiled lindseed oil. I was watching this guys mod last night. He made a pretty slick fence using an aluminum "T track", and increased his cutting surface by simply mounting a piece of MDF to the top, raise the blade trough the new "top", route or dado in some guides. I plan to "hack" mine in a similar fashion this weekend. It's a cheap, Harbor Freight saw. Saw gets the job done now that I swapped out the blade with a Diablo blade, but needs a larger top surface and a fence that doesn' make me want to throw across the room. I ordered a track from Amazon. Last edited by JFISHER; 01-19-2018 at 10:43 AM. Made a little more progress on the miter station and the fire-slate counter top. Built a fence and aligned/flushed with the saw fence. Will add T-track and measuring later in the week. Built the upper cabinets and cut out the drawer faces. Tomorrows list is, lower cabinet doors, and drawers for the upper. Not much to the slate table, wasn't near the same size as the mdf counter top and it's an inch thick, so I bordered it with a 1x6. started on the crappy table saw mod. I will mention, a Diablo blade is a 1000% upgrade on this sucker. Started on my wife's work table this weekend. For the last few years we have been working off plywood screwed to sawhorses, and while it makes a good table, you cant move it out of the way. I decided to go 4x8 for the top. The frame is built to allow a 3" lip all the way around. It will have 4 pull out drawers, and the bottom will be where she stores all her stock, or whatever else she wants to put down there. So far, she is HAPPY! Just about finished with the miter station. Setup the shop vac with a dust separator and upgraded hose. Built a handy platform the keep the bucket and vac together. Progress on the crappy table saw upgrade. Made a new handle for the blade height adjustment, since I'd broken the other on off. Added the "T track" and built a solid, accurate locking fence. Last edited by JFISHER; 01-30-2018 at 03:31 PM. There are some things that would be better constructed from steel, but woodworkers will ALWAYS try to make it out of wood, first. I'm guilty of this as well! Redesigned/Rebuilt the air cleaner. Now has filters on both sides and closer to the 2 main dust producers, the table and miter saws. and will likely do a better job recirculating the air this summer. LOL I want that sign!! All drawers finished, and blocked. 1st layer of top screwed down. I'm liking this thing!!! I could pick one end up by hand pretty easily prior to putting that first sheet of 3/4 on. Man what a difference that stuff makes! This dude is fixing to get stout as I start layering the next 2 sheets! Last edited by Palmetto; 02-01-2018 at 07:20 AM. Consider using MDF for the top sheet. It's much smoother, and makes a nice work surface. Especially with a couple light coats of boiled linseed oil. I already bought a 1/4" sheet of birch that I am going to glue down. Hope it turns out good. I agree with Kevin on the MDF. Other thing, I wouldnt glue it down. That way you can replace it if it gets messed up.